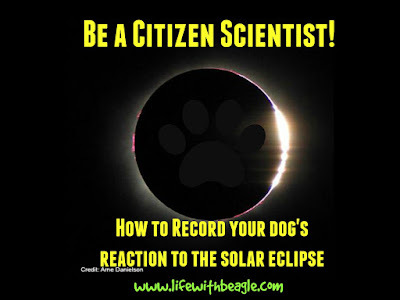 The team is asking you to become a citizen scientist. They want you to observe how pets are behaving, how other animals you observe are behaving, even how plants are behaving. 30 minutes before totality or maximum coverage, depending on where you are in the path of the eclipse. To find out when that moment is for you, check out this interactive map on the NASA eclipse website. Just find where you live on the map and click on it to drop a pin. The chart below will tell you all the pertinent times. During the 5 minutes of totality or maximum coverage. 30 minutes after totality or maximum coverage. Download the iNaturalist app and record your observations in it. The app is free to download and its free to sign up for an account. Download the iNaturalist app from the App Store or Google Play for free. You know what your pets should be doing normally during the day, right? So watch what they are doing during the eclipse -- are they howling, are they laying down, are they hiding? Not saying they will do any of those things, just offering suggestions. Most scientists say animals and plants seem to react to the eclipse the way they react to the sun setting. So if your beagle is suddenly looking for his dinner -- that could be an interesting reaction. Will they look up at the sun during the eclipse? Most likely not. It's not common for animals to do anything so unnatural as to look at something that will hurt them. But just in case, might be best to just leave them inside during the eclipse.